How can you be sure that this coin is unique ? Unique because for all the $2 coins that have been minted so far (about 600,000,000), this is the first I have seen with the core hole so far off center, and with the core missing. So this almost never occurs. Second, even if there are another 10 coins of this same year with the core hole this far off center and with the core missing, the likelihood of any one of these other 10 blanks having the exact same orientation as this one at the time of minting is very slim. 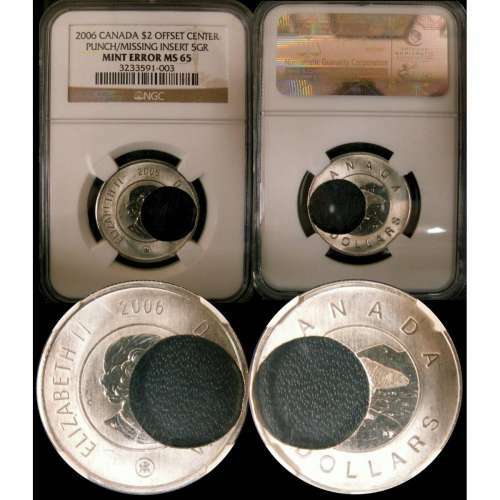 This is definitely a nice coin and it looks like great in the new NGC holder. The 'O' of 'DOLLARS' is weird. I think I saw this coin in Edmonton in November. Very cool, a keeper for sure.